Posted on November 20, 2018 at 8:05 pm. ENDICOTT, Wash. — Author Richard Scheuerman is seeking stories about harvest traditions in the Pacific Northwest. 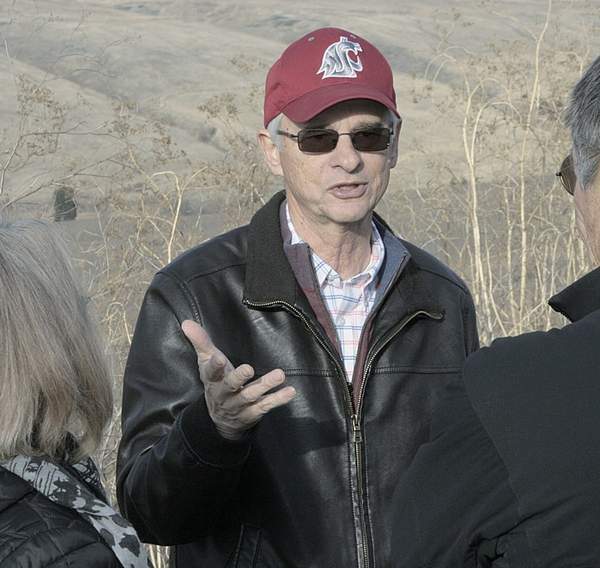 Richard Scheuerman, who is also co-founder of Palouse Heritage Grains, spoke this week at events in Colfax and Pullman, Wash., to coincide with the release of his book, “Hardship to Homeland,” published by Washington State University Press and available throughout the region. “Hardship” is the story of the Volga Germans moving from Germany to Russia to the Pacific Northwest in the 1880s. The book was originally published as “The Volga Germans” in 1985; the new release has a new introduction and a collection of folk stories based on true events. Scheuerman said he had a special interest in telling the folktales passed down through the generations, such as seeing the northern lights for the first time and thinking the world was ending, or students being roped together to avoid walking over a cliff in the middle of a blizzard. Scheuerman is also working on a three-volume series on agricultural traditions and themes in great art and literature, tentatively titled “Hallowed Harvest,” including connections to the Pacific Northwest. “Why did Monet paint his grain stack series? Why were the last 20-some paintings by Van Gogh all of wheat fields? Why did Willa Cather write about growing up on the farmlands of the Great Plains?” Scheuerman asked. Scheuerman’s interests go all the way back to farming and biblical connections. He believes stories in the Old and New Testaments have great lessons for any time, but especially now. “We’re starting to lose our connections with the earth, and in an increasingly industrialized world, we’re finding out how precious those connections are, how vital they are to sustaining a quality of life that’s being threatened in our day and age,” he said. To share harvest tradition stories, contact Scheuerman through Palouse Heritage Grains.